The monsoon period this year has proved catastrophic for elephant-famous Rajaji National Park. The initial estimates have put the infrastructure losses to the tune of Rs 12 crore inside the park in the form of washing away of park inner roads, culverts and land erosion alongside rivers. A joint operation, to protect Uttarakhand forests from illegal felling as well as poaching of wildlife, has been launched by the Uttarakhand Forest Department with the help of the Sahastra Seema Bal and the Uttarakhand police. In sync with the national Wildlife Week, Elephant Day was organised in the Rajaji National Park. A major programme was held in the Chilla range of the park wherein wildlife experts, forest officials, common people and schoolchildren participated in large numbers. People were briefed on elephant species found in the park. 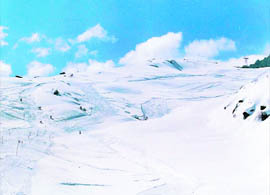 The experts, who are thickly involved in protecting biodiversity in environmentally vulnerable areas where tourism is being promoted, have castigated the remarks of Principal Secretary, Tourism, Rakesh Sharma, who, while patting the back of his department for having successfully chalked out plans to develop Auli as a tourist destination, suggested that the place could be used for sports like badminton, billiards, etc, when it did not snow at the place. Firebrand girl Neetu Dabas, general secretary of the Delhi University Student Union (DUSU), has called for participation as well as contesting elections directly for girls in various students unions across the country for better functioning of college unions. Under the aegis of the Sankalp Foundation Welfare Society, Phoolchand Nari Shilp Mandir Inter College conducted inter-school Common Aptitude Examination on the premises of their school here yesterday. Carman School, Dalawala, conducted a Council Inter-school Senior singing and dance competition on the premises of their school campus here today. The programme began with welcoming of the participants by the Principal . A two-day national conference on “Recent Trends in Microwave and Millimeter Wave Technologies”, was organised by the Department of Electronics and Communication Engineering (ECE) of Graphic Era University (GEU). The Mahatma Gandhi National Rural Employment Guarantee Act (MNREGA), which was till now moving at a snail’s pace, started doing well during September in Dehradun. The non-cooperative attitude of the Executive Officer of the Uttarakhand Haj Committee had almost jeopardised the vaccination programme of Haj pilgrims, but for the timely intervention by the Health Department that was forced to procure meningitis vaccine at the last minute. Uttarakhand Governor Margaret Alva has said active and positive people’s participation in government programmes is a must for an all-round development of rural areas of the state. The Governor was addressing a large gathering of local residents at Van Chetna Kendra at Jakholi (Block Headquarters) in Rudraprayag district today, where she launched a plantation campaign by planting a rudraksh sapling. 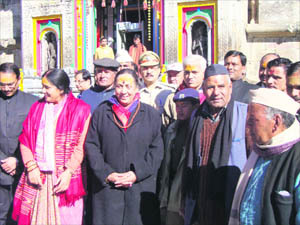 Uttarakhand Governor Margaret Alva at the Kedarnath temple during her visit to Rudraprayag district on Monday. Five more prominent road crossings in Dehradun city will be operated by solar-powered traffic signals from next week. Mighty teams of DAV PG College had double delight winning both boys and girls District Handball Championship held on the Parade Ground here today. St Joseph Academy (SJA) annexed the Sub-Junior Boys Football Championship with ease thrashing Col Brown School 4-0 at the Guru Nanak Academy here today. The Asian School got the better of Doon International School (DIS) by 35 runs during the third Shri Rohitash Singh Memorial Inter-School Boys Super Eight’s Cricket Tournament held at The Heritage School. Hasan Mansoor beat Rakesh Rawat 26-29, 29-28, 29-27 in a tough singles’ semifinal during the Bar Association Carrom Tournament underway on the District Court premises here today. Like other parts of Uttarakhand, the protected area of the Rajaji National Park too faced the wrath of incessant rain this monsoon. Most of the roadways in the park have been swept away and will take some time before these important links can be restored. Swaran Kumar, Deputy Director, Rajaji National Park, admits severe rains have led to a large-scale devastation inside the Rajaji National Park. He puts the losses at near Rs 12 crore, pointing out that most of land alongside rivers have been eroded. The Ganga that criss-crosses the park caused enormous destruction and even rain-fed rivers like Suswa too carried a large volume of water during monsoon. Biggest setback for the Rajaji National Park has been the destruction of safari roads. Safaris inside the park this year seem a distinct possibility as it may take long before these roads could be put back to shape. 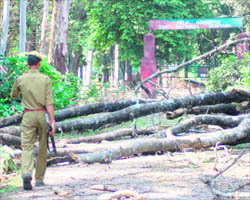 The park authorities are already mulling delaying the post-monsoon opening of the park. “While we are trying to repair the roads on a war footing, the visitors to the park would now have to depend on treks rather than going for safaris due to bad condition of inner park roads,” Swaran Kumar pointed out. However, the sole solace that has come in the form of rains is accumulation of water in the water holes that had been dry for years together. It has also led to revival of heavy undergrowth within forest area. Innumerable streams and brooks have been replenished. Wildlife rich Rajaji National Park is home to leopards, Himalayan bears, cheetal, hog deer, barking deer, sambar, wild boar, antelopes such as nilgais, gorals, jackals, hyena, sloth bears, pythons, king cobras and above all Asian elephants. Presence of tigers has also been reported from inside the park. “The operation ‘Arundhati’, aims at destroying the bases of smugglers and their nexus with Nepali Maoists which have emerged at the Indo-Nepal border, and protecting the precious elephant of the Terai region,” said Anil Baluni, vice-chairman of the Forest Advisory Committee in the state, while launching this operation at Boom range of Champawat district. According to the Forest Department, this operation will pay special attention to save the elephants which are being poached by the smugglers from across the border for the precious ivory being smuggled to China via Nepal. “Formerly, the elephant herds of the Terai region used to cross into Nepal easily, but after the smugglers’ activities on the border deterred them to do so, they are now destroying the Indian settlement,” said Baluni. The vice-chairman said this operation would involve officials of Champawat district, Udham Singh Nagar and Nainital who would jointly patrol on the border to nab smugglers and destroy their bases. “On the launching day we conducted joint patrolling on the Nepal border and this will continue,” said Baluni adding that the government of India had also been apprised of the programme which aimed at protecting wild elephants of Terai. Chief guest former Chief Wildlife Conservator of Uttarakhand Anand Singh Negi highlighted the immense wildlife wealth present in the whole state and the need to conserve it. A dedicated day for the cause of the elephant is a step to generate awareness and bring the common man closer to this animal, which is considered as quite sensitive, he added. 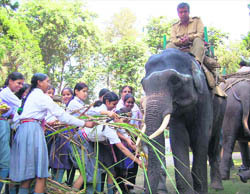 Emphasising the need for generating awareness from children about wildlife, Wildlife Warden Vikram Singh Tomar said if the coming generations were made aware of the need to conserve elephant or for the matter any animal then it would have much more impact in efforts to conserve wildlife. “We need to have a specific programme which links environment and wildlife conservation with study curriculum as by this way children at younger age itself will know the immense importance of wildlife, which will make our efforts in its conservation much easier,” said Tomar. Wildlife Trust activists stressed the ways to lessen the man-animal conflicts, particularly in the light of many incidents of elephant attacks witnessed in the Raja Ji Park as well as adjacent forest areas. Directors, Man-Animal Conflict, Sunil Singh and Dinesh Pandey apprised the gathering on the precautions and ways to facilitate a free movement of elephants in the forest area while making wildlife adventure as a potential tourism revenue option for the hilly state. Notably, Wildlife Week is held in the first week of October annually to promote awareness about wildlife among common people, particularly about its conservation. District Forest Officer Gopal Singh Rana, Chilla Ranger MS Negi, schoolchildren, forest staff, local residents and wildlife lovers participated in the programme. 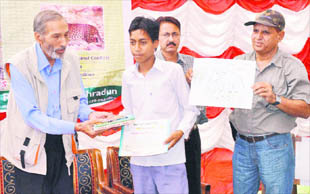 A painting competition was also organised where students were asked to portray their views about wildlife and what they learnt from the seminar. The most creative ones were awarded while all present were given a compact disc compilation of “Birds of Uttarakhand and their Calls” and books written on tales of Jim Corbett. Dr Sejal Worah, programme Director of Green Hiker, said: “Rakesh Sharma on the one hand talks of creating world-class helipads at Auli, and on the other of using the area for sports such as badminton and billiards. Why do we need to spoil the ecology of a place for holding games which can be held in any other part of the country. There is no synchronisation between his two different viewpoints”. This is where the real problem lies. Scientist, Wildlife Institute of India, Dehradun, S Sen said: “The insincerity on the part of people who are driven by the objective of commercialisation rather than protection of environment or assisting communities have become common everywhere in the country. I have witnessed that during my various postings as forest conservator”. Unmindful of his parting remarks which Sharma made while presenting Auli as the most popular destination for adventure tourism in the state, he explained the preparations by saying, “Auli is blessed with the rarity of skiing options at 10,000 ft and scintillating views of magnificent peaks at 20,000 ft. It has an airport at Gauchar, rope way at Joshimath, state-of-the-art restaurants and hotels. Besides, there are two helipads at Auli and Joshimath. We are also modernising the train service within next 60 days”. Talking of accommodation, he also assured the gathering of the provision for the best services by saying that the state government was on its way converting the unimpressive 12-room state government accommodation into 23-room plush hotel which would offer the finest facilities in the premises in the beginning of the January when the SAF Winter Games would get over. He said the FIS had certified a ski slope at the place which was 1.2 km long. The drainage of the slope had been covered with a plenty of green trees. “We have created an artificial lake for snow making. We have bought snow guns for the purpose. A pump house, compressor room, ski lift, chair car are other amenities provided at Auli,” he said. To complete the picture of a competitive winter destination bedecked with facilities for shoppers and all paraphernalia regarding the necessary equipment related to skiing and other winter sports, he said: “We have started ski shops where tourists will be able to buy or rent things such as winter dresses, ski boots and other accessories. The outlets selling snow equipment such as snow scooters, rescue equipment, display dresses and snow grooming have been made available at the spot as well”. To alleviate the concerns of the environmentalists, he averred that the Tourism Department had provided a widespread grass cover, including that on slopes and a solid waste management disposal system at the spot and began a plantation drive there. Counting on other brownie points, which according to him the site scored over, he said nine points had been developed from where one could get different panoramic angles of the place. Recently in the city to participate in the Akhil Bharatiya Vidyarthi Parishad (ABVP) convention, Neetu spoke to The Tribune on student union polls, role of girls and her emphatic victory which enabled the ABVP to wrest back power from the NSUI with her winning by the highest number of vote margin in all seats. Urging girl students to come forward in working for a stronger India, Neetu said, “Girls should recognise their power as they have the power and capability to change the society, eventually making a stronger nation”. She said India could only become “vishwaguru” (world power) when women came forward matching shoulders with men. Acknowledging various problems, social stigmas and varied roles women have to perform, Neetu pointed out that despite such odds, young women were playing a pivotal role in making India shine. “Be it the Army, Navy, Air Force, IT, medical, corporate, social services or adventure sports, everywhere girls are performing excellently, which was quite restricted a few decades back,” said confident Neetu, who defeated her rival by a record margin of 4,500 votes just a month back. Highlighting that the ABVP is quite serious on the issue of commercialisation of education as well as national issues of Naxalisim, terrorism, Maoism, Neetu said the party had been taking these issues quite seriously and it was in the better interests of students to join student wings as they made one disciplined, focused and responsible citizens. On the low turnout of students for voting this year in DUSU and a meager 40 per cent students cast their votes, Neetu termed it as lack of awareness among students and varied factors which would go up in sync with the good work done by the student unions. Notably, the DUSU student union poll is the biggest in the country as it includes more than 51 colleges numbering almost one lakh students. Around 1,200 students from 50 schools participated in the general knowledge examination. The examination was divided into two categories. Students from classes VI to VIII appeared in group A examination, while those from classes IX to XII were in group B. The paper was of 100 marks with objective type questions from general knowledge, mathematics, history, science, geography and English. The examinees were charged Rs 20 as entry fee which would be given later to poor and underprivileged children. Students from Shri Guru Ram Rai, Kasiga School, Government Girls Inter College, CNI Boys Inter College, Sophia High School, Gandhi Intermediate College and others took the examination. The winners will be declared online on November 14 at www.sfws.org. Those with 60 per cent marks and above will be awarded certificates, while prizes of Best Participation and Best Result will also be given away to the best performing school. A large number of students from 12 different schools, participated in the event. Four schools, including Presidency School, Indian Public School, GRD Academy, Niranjanpur and The Montessori School, participated in the folk dance competition. Five schools, including Heritage School, Welham Girls, St Judes, Unison School and Touch Wood School, participated in the group song competition, while St Xavier, St Thomas, Carman and Doon Presidency were the participants in the Western dance competition. The winners for the competitions were GRD Academy for folk dance scoring 74 points, Unison Public School for group song with 81 points, while Carman stood first in Western dance competition with 83.5 points. The chief guest of the programme was Russell V Gardener, Principal, St Thomas School who awarded the winners and congratulated everyone for their participation in the function. Discussions on enhancing the services of mobile, satellite, radar and other communication equipments, while decreasing their congestion, were held by the experts during the conference. The conference began with lighting of the ceremonial lamp by chief guest Dr RC Aggarwal, Director, Defence Electronic Application Limited (DEAL) accompanied by Dr SS Sundaram, scientist, Institute of Research and Development Engineering (IRDE), and Dr S Raghvan, NIT, Trichy. The experts on microwave technologies shared information among students and presented about 32 research papers. He also asserted that the two-day seminar would surely enrich students with quality and significant information given by renowned scientists from across the country. Present at the seminar were Dr BS Jaiswal, Dean Projects, Prof Anjan Basu, IIT Delhi, Avdhesh Kumar Shukla, Senior scientist, DEAL, Prof MV Kartikeya, IIT Roorkee and other eminent guests from all over India. Around 10,770 new registrations were done in the month alone and the highest amount of Rs 330.02 lakh, has been spent since then. It is the highest amount that has been used after the scheme was launched in 2008. Sachin Kurve, who joined as the Dehradun District Magistrate (DM), had taken over the responsibility of MNREGA. Earlier, as DM in Tehri, he saw that the scheme did well there too. After his transfer to Dehradun, he found the dismal performance of the scheme and took it up as a challenge. He had recently convened a meeting of the staff and asked them to set targets for better results. Monitoring the scheme personally, a record 10,770 new persons were registered in September. Besides, 9,446 families were photographed and work was still in progress for the remaining ones. Till August, the work-in-progress was just 2.3 per cent which increased to 36.90 per cent in September. Not only the increase in registration, 156 new pieces of work have been given a go-ahead at a total cost of Rs 675.04 lakh. Talking to The Tribune, Kurve said new pieces of work had been approved in Doiwala, Vikas Nagar and Sahaspur blocks with amounts of Rs 69.17 lakh, Rs 368.138 lakh and Rs 237.735 lakh, respectively. It so happened that neither informing the department nor taking note of availability of vaccine, the committee inserted advertisements in local newspapers published on September 24 that vaccination programme of the pilgrims of Dehradun would take place on September 26 and also announced vaccination schedule at other districts as well. This year, the Haj pilgrims were to be vaccinated against seasonal influenzas, especially those persons living below the poverty line, above the age of 65 years, children below the age of five years and pregnant women. The department was taken aback as it did not possess meningitis vaccine in the store. The vaccine is provided by the New Delhi-based National Centre for Disease Control (NCDC). Besides, the Haj committee had also neither provided a list of persons who were to be vaccinated by September 23 nor informed the date when the vaccination had to be undertaken so that the department could make prior arrangements. With September 25 being a public holiday, the department and the NCDC were closed, forcing the Additional Director (Health) to make requests for the vaccines. As the vaccine requires controlled temperature, special arrangements were made. The Additional Director (Health) has even raised the matter with Vinita Kumar, Principal Secretary of the Social Welfare, so that there is better coordination between the Health Department and the Haj committee. In all, 164 persons were vaccinated in Dehradun and in the state 1,107 will be vaccinated, while 250 are to be vaccinated under a special quota. The Governor said rural communities living in the mountains had always protected the rich flora and fauna through religious and cultural beliefs. The traditional knowledge and wisdom is continuing till today. “Maiti” is a unique movement in Uttarakhand and forms an integral part of wedding ceremonies in Garhwal and Kumaon hills. The Governor said she had come here to offer her participation in this glorious traditional custom, which was associated with the ritual of planting of a sapling by a girl at her parents’ house at the time of getting married. Laying stress on increasing the vegetation cover, the Governor said the state was already witnessing harmful impacts of deforestation in the form of disaster on account of recent unprecedented rainfall in the state that caused widespread loss of life and property. “Natural disasters occur only when there is reckless human interference in natural processes on the pretext of development. As custodians of the natural heritage, mountain societies also have the rich legacy of the Chipko Movement before them. The only solution to escape the fury of natural disasters will be to rejuvenate the movement which has acquired the shape of a massive environmental campaign in the world,” she said. The Governor said the local populace itself would have shoulder the onerous responsibility of eliminating the so-called forest mafia that resorted to illicit felling of trees for personal gains. “This is not the responsibility of the government alone and people will have to play an active role in this direction,” she said. Eulogising the stellar role played by women folk in the hills in every sphere of day-to-day activities, the Governor said the time had come to reduce drudgery of the women folk and make them economically empowered. Referring to rampant migration of the youth from the hills, she said employment generation and technical training for developing entrepreneurship based on local resources was very much required. The Governor laid stress on discouraging the use of plastic bags and urged people to support eco-friendly products. She also emphasised upon finding a lasting solution to damage caused to crops by wild animals such as monkeys and boars. The Governor expressed serious concern over the widespread loss of life and property in natural disasters, including landslides triggered by unprecedented rainfall in the state. She said serious thought needed to be given to the restoration of road transport and communication network and potable water supply lines. “People’s participation in this process is highly essential,” she added. Earlier, the Governor visited the famous temple shrine of Kedarnath and paid obeisance there. Others who were accompanying the Governor included local MLA Asha Nautiyal, Secretary to the Governor Ashok Pai and ADC to the Governor Yogendra Singh Rawat. At the Jakholi programme, Matbar Singh Kandari, Minister of Irrigation and Minor Irrigation, Zila Panchayat chief Chandi Prasad Bhatt and a large number of local residents were present. Work at these traffic signals is on in full swing. These traffic signals will be put up at Nehru Colony, Lal Pul, Doon Hospital, Sahastradhara crossing and Dilaram Bazar, said YK Agarwal, Director, LSTL Media Limited, a Noida-based company that is working on the project. “Solar traffic signals will eventually be installed at a total of 34 points in Dehradun,” he added. The company has a 10-year contract and it will install, maintain and service the lights. “We are not charging anything for the work. According to our project, we will earn through hoardings that will be put up at these traffic lights once they are ready. Some part of the revenue collected through hoardings will also go to the authorities here,” Agarwal added. Circle Officer (Traffic) Navneet Singh Bhullar said traffic lights would improve vehicular movement in the city. Solar-powered traffic signals at present are installed on the Shimla bypass crossing, Sharanpur Road crossing, Prince Chowk, Dwarika Store, CMI Chowk and Arha Ghar. 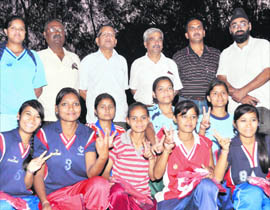 In the girls’ final, DAV PG College got the better of SGRR, Nehru Gram, 7-6. The two sides had a tough encounter in the final clash, but ultimately DAV girls managed to have an edge. Aarti with four goals and Pooja with three goals played the pivotal role in the win of the girls final. Notwithstanding complex defense of the rivals, girls of DAV kept up the good work to ensure the win of their team. DAV PG College also registered final win in the boys’ final beating Stadium 20-17. 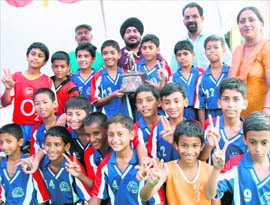 Dilbar scored highest with six goals in the match. Gagan and Vinod Mamgai also contributed chiefly for DAV College. SJA played an aggressive game attacking the rival team right from the word go. Col Brown was not given any chance to settle due to the continuous attacks by SJA players, who showed tremendous performance. Tenzin (eighth minute), Ishan Negi (18th and 38th) and Hrikshit Chauhan (32nd) scored in the win of SJA, while Col Brown couldn’t score any goal. Meanwhile, PS Kalva, Principal of GNA, presented the winning and runners-up trophies. Individual trophies were also distributed to the players. The Principal thanked all 16 participating teams. The Asian School won the toss and opted to bat first. It scored 50 runs losing five wickets in the first innings. While replying, DIS could just score 22 runs at the loss of three wickets. While in the second innings the winning team set a target of 26 for three. To this, DIS could reply with 19 runs in total giving away five wickets. Priyanshu of The Asian School played an important innings of 24 runs to emerge as the best batsman of the match. In the second match, Hilton School beat Summer Valley by 32 runs. 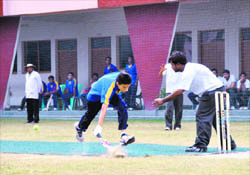 Rohit of Hilton scored highest 12 runs. Mansoor entered the final of the singles’ championship. Surender Pundir, Sushil Kumar, Chitranjan Trivedi and Suresh Joshi were the referees in today’s match. Only three final matches of singles, doubles and lucky doubles are left and dates of these will be decided later by the Bar Association. After concluding the tournament, the winners will also be given away prizes.